If it looks like a cheesy hashbrown and tastes like a cheesy hashbrown, it must be a cheesy hashbrown, right? Right. Unless it’s actually cheesy cauliflower cakes. Hey, I wasn’t trying to trick my family. Really, I wasn’t. I was planning to be completely up front and honest about the platter of cauliflower on the table. Is it my fault they just assumed I’d fried up some hashbrowns? And would you believe, when I told them that in fact, there were no potatoes in these – only cauliflower – some of my boys didn’t even believe me? Then my pickiest boy helped himself to seconds. Who am I to argue? I’ll admit that as hard as I’ve tried, cauliflower is still not at the top of my favorite vegetables list. We all eat it steamed or roasted, but our reactions are usually something like “eh” when it comes to eating cauliflower fixed in those ways. 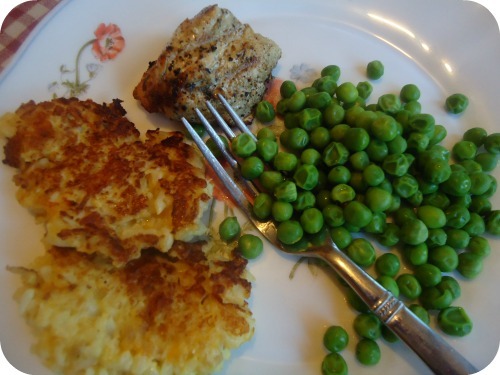 When I found this cauliflower cake recipe and decided to play with it, I was hoping it would at least be just a little better than “eh.” To my surprise, I found myself unable to stop nibbling as I was cooking these for our dinner. These are way, way better than “eh.” I mean, my pickiest boy ate seconds. That is worth stating twice. I believe these will be a part of our normal veggie rotation. Not only are they tasty, they’re quite easy to put together. Boil for about 10 minutes or until tender. Stir in eggs, shredded cheese, minced onions, and salt until well combined. Melt 1-2 Tablespoons of palm shortening or coconut oil in a skillet. Scoop 2 Tablespoons of mixture into the melted oil, pressing down into a cake. Fry over medium heat until brown and crispy - about 2 minutes on each side. Even if you don’t like cauliflower, you’ve got to try these. Pretend they’re hashbrowns if it helps. It worked for us! Hi, i have a question; would these freeze well? These look yummy! I have made “mashed potatoes” with cauliflower before and was hard pressed to taste much difference. Will put these on the list to try! Who knew cauliflower and potatoes are so interchangeable! 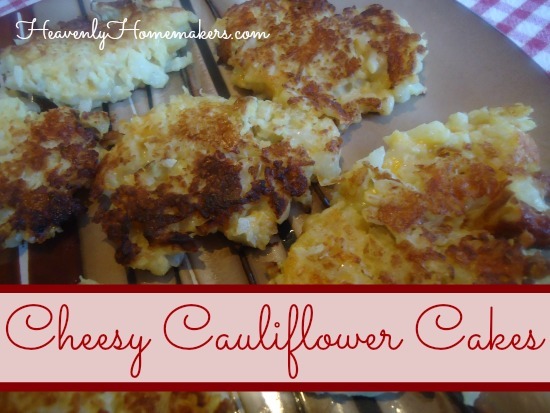 I bet I could convert this recipe and make cheesy cauliflower casserole…my family loves cheesy hashbrown casserole…maybe I will try to trick them…and yes..I WILL be trying to trick them. Teenage boys are tough customers! Looks yummy and I can’t wait to try! How do you make your homemade bread crumbs? Thank you! I wonder what you could sub for the bread crumbs to make it gluten free? I’m thinking you could leave them out entirely, and just fry them all up like hashbrowns. Glutino makes gluten free bread crumbs. Oh, my gosh, cauliflower is my new favorite vegetable thanks to the addition of cheese. Though, I make a cauliflower gratin (similar to baked mac and cheese)topped with bread crumbs. The sauce has Gruyere cheese and a little grated nutmeg, so yummy. I serve it as a main course with large salads and your honey whole wheat dinner rolls. This sounds like a fun one to try and I have my fingers crossed it is as good as your taste testers think it is!! I also just saw this recipe in Fitness magazine how to make pizza crust with cauliflower. There is a how to video with the instructions! Hope this link to it works. May have to copy paste or just google fitness magazine. This looks wonderful, can’t till the cauliflower goes on sale so I can make this…..
Just a question about the pyrex you showed….I went in and did think about ordering a couple of sets, then they wanted you to sign up for some kind of charge acct. in order to get the $10.00 off…..which I did not like, then I began to read the comments….did you read them ? Several people had the pyrex to explode in the oven….and it did happen to me once also…..I emailed pyrex and they did totally nothing about it……I even kept it to return to them and just decided to pitch it and forget it…….so I am wondering about your thoughts on this ……. The price has gone up since I wrote about this. They were $12.79 all by themselves. Now they’re back up to $29. As far as the review go – I’ve never had any trouble with Pyrex and plan to continue using it as it is such good product. I just saw that the price went back down again! I’m not seeing the link to the Pyrex. Could you post it here? Yay, it just went back down! I’ve just started eating cauliflower since starting the Trim Healthy Mama diet. And I love it with cheese! Praise God for good nutritious food that we can eat! Some people don’t have any access to fresh food and definitely not delicious! I like Macafoni and Cheese! I tried making these for lunch today, and while they were quite tasty (with the addition of a little more salt and some pepper), I could not for the life of me get the “cake” consistency to work. I followed the recipe exactly but the “brown and crispy” part stuck terribly to the pan when I tried to flip the cakes and they didn’t hold together very well at all. I experimented with different oils (coconut and sunflower) as well as different cooking temps and times, but nothing worked successfully. I finally gave up and just fried the mixture up like hashbrowns as was suggested, but again, nothing brown or crispy came out…just a big cauliflower-egg scramble. Any suggestions for what to do differently in order to get the cakes to actually turn out like cakes? Do you know if 1 bag of frozen cauliflower would be equal to about 1 head of cauliflower? Or maybe 2? I would like to try this recipe using frozen sometime too. It looks delicious! I am not 100% sure, but I would assume they are approximately the same. I don’t think you would need 2 bags, but it would be good to have an extra on hand just in case you do need more. A weight on the cauliflower would be helpful, since head size varies so much. I think mine was too big, because my cakes didn’t stick together at all.